For several months, journalists like me have been going back and forth to Melbourne’s County Court, unable to broadcast what we’d learnt about George Pell’s crimes. Outside court, there was at times high drama – all the sound and fury of cameramen jostling and campaigners brandishing placards at the cardinal as he arrived. He wasn’t called to give evidence, and so we didn’t hear a word from him for the majority of the trial. As the court heard vivid descriptions of how in 1996 he had forced himself upon two victims, pushing his archbishop’s robes to one side in order to expose himself, he didn’t flinch. The jury was told how one young boy had pleaded for Pell to let him go – only to be shocked into a silence that would last for decades. 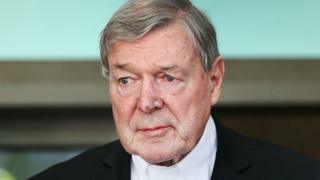 Pell’s defence barrister is one of Australia’s most experienced and expensive lawyers – his speeches focused on areas of doubt. Robert Richter QC repeated over and over how highly improbable – if not impossible – it would have been for any of the abuse to have occurred. At one stage, Mr Richter even referred to Pell as “the Darth Vader of the Catholic Church”, painting him as a bold leader vilified by the media. Pell certainly has his critics – some came to the court to watch and see him in the dock. Although the proceedings couldn’t be reported, there was nothing to stop members of the public coming in to listen. Some of Pell’s supporters attended too, sending sympathetic smiles in his direction, and exchanging small talk as he went in and out of the court. After two trials, one hung jury and many months of waiting – the results of this long process are now public. The pace of justice has felt slow at times, but it has resulted in one of the Catholic Church’s most prominent and powerful figures being held to account.